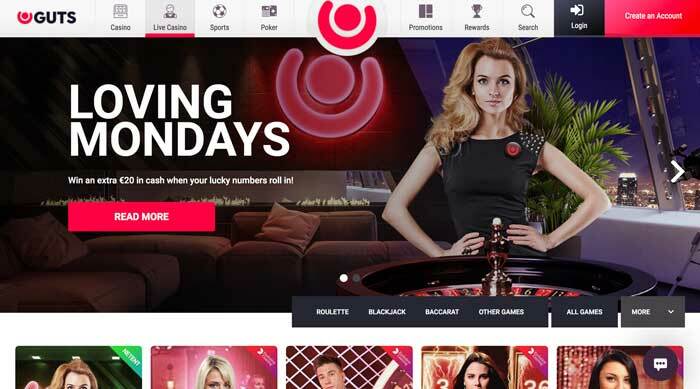 A Reliable Review of Guts Casino - Is Guts Casino a Safe Site to Bet on? 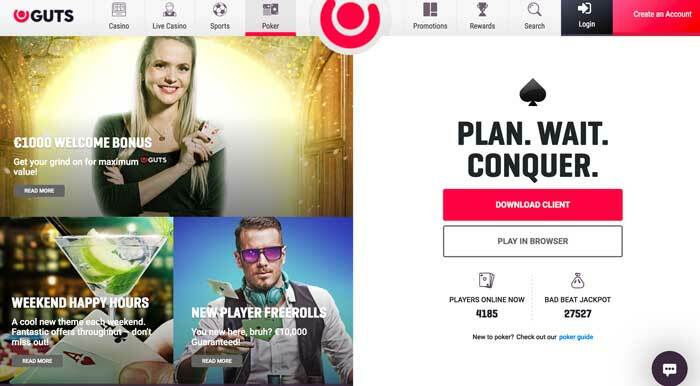 The Guts platform began its life solely as an online casino in 2013, and it was only more recently that it branched out into also offering up poker and an online sportsbook. This expansion has seen the platform grow even more in popularity. But some of the responsibility for this can be taken by MT SecureTrade – the platform’s operator. It ensures that the casino has a great foundation for operating from, providing visitors with a strong online site to enjoy. As an addition to the desktop version of the site, Guts also provides a mobile offering. This means that you can take its selection of casino games, sports betting options, and more with you anywhere that you go. To access the mobile version, you simply need to enter the website address into your device’s browser. This will then load up the optimized version of the site, giving you the best view of it on your device’s screen. All of the same sports betting options will be available to you, while a vast majority of the Guts casino games will also be on hand. The Guts platform is one of the best in terms of licensing status because it actually holds three different ones. The first is from the Malta Gaming Authority, while its secondary one is on hand from the UK Gambling Commission. Finally, it has a third one from the Curaçao eGaming company. Therefore, everything that takes place at the Guts site is done within a secure and fair gaming environment. For further information on these licenses, you can scroll down to the bottom of their website. While holding these licenses does make the site available to a large number of countries, there is still quite a vast group of locations that cannot register at the site. This includes such places as the United States, South Africa, India, Australia, Belgium, France, and Portugal. Therefore, while it’s great for places like the United Kingdom and others to join, Guts isn’t available everywhere. 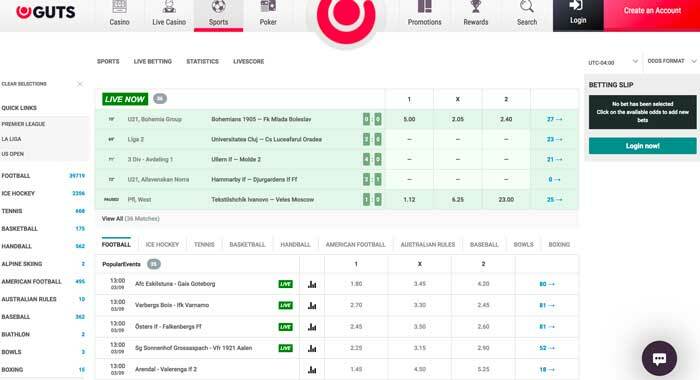 As things stand at the moment with the Guts platform, you’re not able to claim a welcome offer at the sportsbook section of the site. The casino still provides such, and so does the poker room. However, if you’re looking for a welcome offer relating to sports, then Guts isn’t the right place for that just yet. If you’re intending to utilize the casino section of the site, then you have the ability to claim a welcome offer of a 200% bonus. To receive this, you simply need to complete your registration and continue with making your initial deposit. At the same time, you should enter the bonus code of GUTSCASINO. Then, the 200% will be added to your balance, and it has a maximum value of €100 for you to receive. Alongside the 200% bonus, you will be given a total of 20 free spins per day for the proceeding five days. 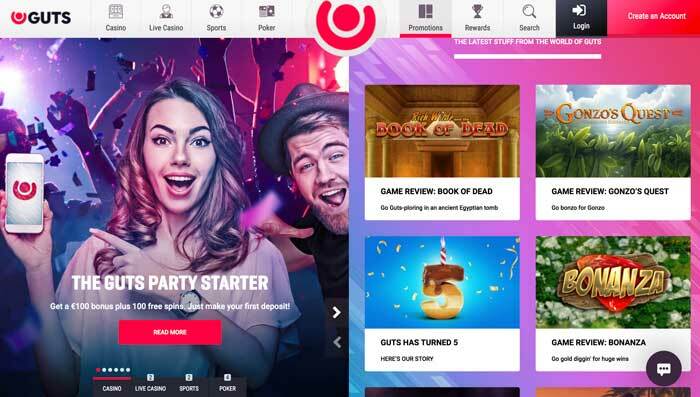 That makes a massive 100 free spins for you to utilize on the slot game known as Book of Dead. What’s more, these free spins are completely wager-free, meaning that whatever you win from these, you get to keep! As long as you deposit a minimum of €10 and use the bonus code, the funds and free spins will be yours. Just remember that if you deposit via Neteller, Skrill, or Paysafecard, you cannot claim the welcome offer. 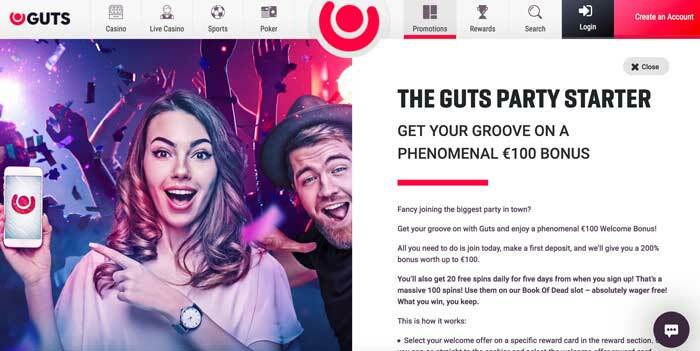 There’s also a €1,000 welcome bonus on offer for poker players to be on the receiving end of at Guts. Everyone who registers a poker alias at the site will automatically receive this welcome bonus. This is released in portions of €5. For every €25 that you contribute towards a game’s rake, you’ll receive the €5 bonus on top. The maximum bonus value will be available for a 60-day time period, and the bonus funds are also without wagering requirements! When it comes to adding funds into your Guts account, you have a few payment methods to choose from. While it doesn’t have the largest collection of such to make use of, it still provides some of the most popular. Visa and Mastercard credit and debit card deposits are available to use, while Skrill, ecoPayz, and Neteller e-wallets are also available. If you would like to use a prepaid card option, then the site accepts Paysafecard, while players from Finland have the option of using Euteller. Other country-specific possibilities include Sofort, Interac Online, and Zimpler. And failing any of these, you can make use of a bank wire transfer for funding your Guts account. Fortunately, the Guts platform manages to process withdrawals through within a 24-hour period as standard. This means that you should receive your funds within a swift timespan. Of course, this depends upon the method that you use for making your withdrawal. Options such as the Skrill or Neteller e-wallets are usually the fastest possibilities, providing an instant pay-out once the site has processed it. If you are withdrawing via a credit or debit card, then the process will usually take between one and three business days. Other banking options that are country-specific will also usually be done within a three-day period. The only exception is really the bank wire transfer option, which can take up to five business days for your funds to show in your account. All players have the ability to make a maximum withdrawal of €5,000 per week at Guts. Should You Play at Guts Casino? The Guts Casino platform has been running for a few years now, and this is testament to how great its features are. It’s a shame that the sportsbook doesn’t yet provide a welcome offer for its newcomers, but this could change in time. The casino and poker room promotions are both thoroughly appealing, with free spins even being a part of the casino offer. Furthermore, with the ability to use a decent range of payment methods for funding your account and withdrawing from it, Guts is certainly able to appeal to a wide range of gamers. It is for these reasons that it’s also a bit of a let-down that the Guts site isn’t available on more of a global scale. For those countries that can access and sign up to the platform, it’s great. It’s just a shame that more locations aren’t able to experience everything that it has to offer. But for those that can, there’s also the possibility of accessing its features via a mobile device. Additionally, there’s a 24/7 customer support team on hand to help you with any queries you may have. And one more thing that is quite a stand-out point of Guts is that the casino is able to provide games from a wide variety of developers. Therefore, you shouldn’t ever experience boredom when a member of this platform!